The stretchy gluten which gives a dough its elasticity is formed when the two proteins glutenin and gliadin bind together. 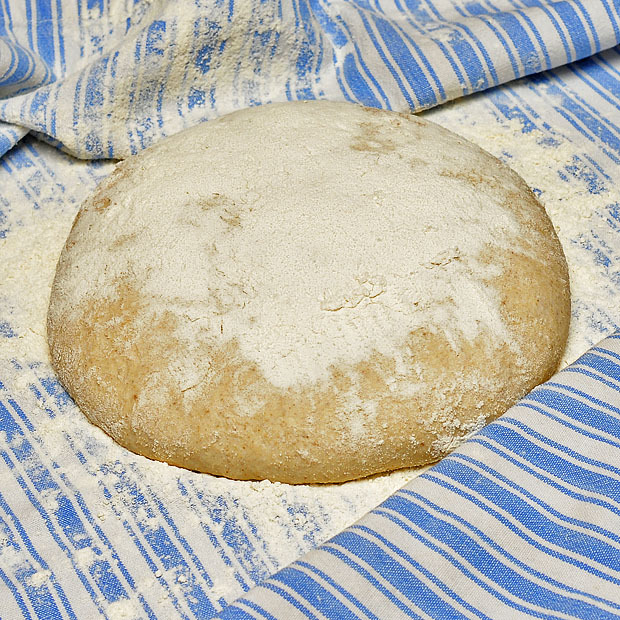 Kneading can speed up this process, but in a wetter dough the mobility of glutenin and gliadin increases, and given enough time they can actually manage it all by themselves. That’s why a wet dough needs time to develop the gluten network, but no kneading. This is to show what 3 g fresh yeast looks like, in case you don’t have a balance that can accurately weigh such a small mass. I’ve often seen it mentioned that a longer fermentation and/or less yeast gives a richer aroma. I think it’s true, but I’m not quite sure why this is the case. If the flavor compounds are produced proportionally to the carbon dioxide, the easiest way to increase flavor would be to up the amount of yeast. A lower temperature and/or less yeast would only mean that it takes longer to produce the same amount of carbon dioxid and flavor compounds. However, most of the advice I’ve seen about baking suggests that there is a flavor improvement by extending the fermentation time. So to rephrase the question: Why is the desirable bread flavor not proportional to the amount of yeast added? Some claim that the bitter flavor of pure yeast can dominate the flavor of the resulting bread if used at to high levels – but I have never been bothered by yeast flavor, even when using 50 g of fresh yeast for 1-2 kg of flour. But maybe I’m just insensitive to this bitterness? It could also be that the flavor profile produced by the yeast benefits from the lower temperature, but I doubt that one would actually be able to tell the difference in bread (you can easily tell the difference in beer, but here the fermentation may take from days to weeks – see also my post on Baking with hefeweizen yeast). Another possible explanation could be that enzymes, which are present in the flour or slowly produced by the yeast, contribute significantly to the flavor if given enough time. Amylase is one such enzyme which converts starch to sugar. It’s naturally produced by yeast, but it’s often added in pure form to “industrial doughs” to speed things up. Yet another explanation is that a long proofing time will allow a certain production of organic acids by the bacteria which are always present (this of course is what gives sour doughs their characteristic flavor). The most unusual step in making no-knead bread is that it’s baked in a preheated heavy cooking pan, also known as a Dutch oven, usually made from cast iron. But this is indeed very clever! Professional bakers are lucky to have steam inlets in their ovens, because steam has a heat capacity which is much higher than that of dry air. Because of this the loaf will heat up quicker, giving a better oven spring. But the moist air inside the covered pan does more: as long as the loaf is colder than the pan the moisture will actually condense on the surface of the bread, thereby keeping it moist. This ensures that the oven spring is not hindered by a dry crust. Secondly, this moisture is important for a proper gelatinization of the starch: we are setting the stage for the Maillard reaction. After about 30 min the lid is removed. At this point one will see the nice oven spring, but also notice that no browning has occured sine the temperature in the crust has been kept below the boiling point due the condensation of moisture on the surface. Once the lid is removed moisture can escape and the temperature in the crust rapidly rises above 110 °C where the Maillard reaction proceeds more rapidly. This is what gives the crust it’s nice brown color and also gives rise to the beautiful smell of fresh baked bread. At this point, the total baking time should be determined by the color of the loaf. When the surface is sufficiently browned your no-knead bread is finished. Salt is very important, so don’t omit it from the bread. If you try to reduce the amount of salt in your diet – do so by eating less fast food and industrially prepared food. Don’t mess with the salt levels of home baked bread. It’s there for the taste, but it also improves the strength of the gluten network. Mix everything until the flour is completely moistened. Cover and leave for 15-25 hours. Pour onto a floured surface, fold 3-4 times, shape rapidly into a boule, place it on a generously floured cloth/towel seamside down and proof until doubled in size (~2 hours). Dump seam side up into a cast iron pan preheated to 230 °C and bake with the lid on for 30 min. Take the lid of and bake until the crust has a dark golden color – approximately 15 min. The percentages in the recipe are so-called Baker’s percentages, giving the amount of the ingredients in percent of the flour. The amount of water is often referred to as the degree of hydration. I’ve had good results with a hydration of 77%, but you may want to adjust this depending on your preferences. In fact, it’s impossible to know exactly what hydration Jim Lahey used because of his volume measurements! The recipe posted on the Sullivan Street Bakery’s homepage has a hydration of 80%, but I wonder whether the amounts are calculated or measured. My advice is to start at 77% and then adjust up/down in the range 75-80%. By adjusting the hydration you will indirectly also adjust the size of the pores (more water = larger pores) and the moistness of the bread. The higher hydration will of course yield a more sticky dough, but don’t forget that it’s a no-knead bread, so you’re supposed to handle the dough as little as possible. Regarding the amount of yeast I’d start with 3 g, but if you feel that it rises to quickly you can lower this to 1-2 g. The main reason for this variability is that the activity (= number of living yeast cells) of fresh yeast decreases with time. Homebrewers can calculate exact pitching rates for yeast based on a ~5% loss of viability per week for liquid yeast. My guess is that compressed yeast is more stable, but I haven’t been able to find any data on it’s viability. My no-knead breads look a bit different every time I bake them, but that’s OK. The required hydration depends a lot on flour as well of course! No-knead breads can greatly benefit from substituting some of the white flour with whole grain flours, or ancient cereals such as emmer (farro), spelt, einkorn etc. Whole grain flours tend to bind more water though and develop a less strong gluten network. This last point is well illustrated by my failed attempt to bake a no-knead bread with 100% emmer. The resulting flat loaf is shown in the picture below. Jim Lahey’s “No-Knead” recipe is on the Sullivan St. Bakery’s website. http://www.sullivanstreetbakery.com/recipe/baking-perfect-loaf-bread-home It includes masses and the dough’s hydration level is 80%. One reason for a better flavor with no-knead bread is that the dough does not oxidize as much as it does when kneaded. As I understand it, when the gliadin bonds break away from glutenin, and possibly at other points as well, the dough oxidizes, causing a loss of color and flavor. This is not the only reason, as it is generally presumed that all lean, long-proof breads will develop more flavor than something baked same day, even those that are kneaded to a windowpane state before being put in the refrigerator for 8+ hours. 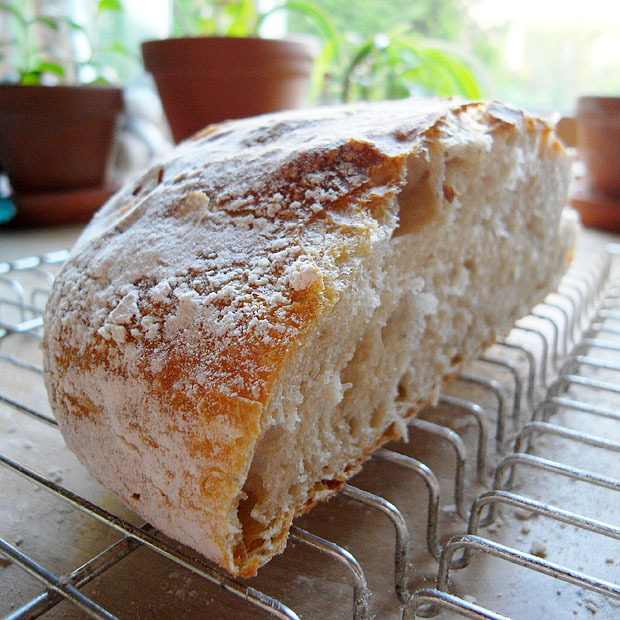 Still, low- to no-knead breads do save some flavor over heavily kneaded breads. Brian: Good point about oxidation! In this article, http://www.nytimes.com/2010/02/24/dining/24curious.html?_r=1, where Harold McGee explores variations of the no-knead, a hydration level below 75 % is recommended. The Roux Brothers’ New Classic Cuisine from 1983 includes a recipe for no-knead bread. 3 hours from flour-bag to mouth – crusty crust, light, fluffy centre and really delicious even with dried “machine” yeast. You might like this post at my friend’s blog; he’s modified the no-knead recipe (using metric weight, of course) and I find that it works beautifully. I’ve modified it still further, including using about 1/3 whole grains for better flavor and nutrition. Why a pan should be preheated? I seems to me that cool pan will allow more time for oven spring. 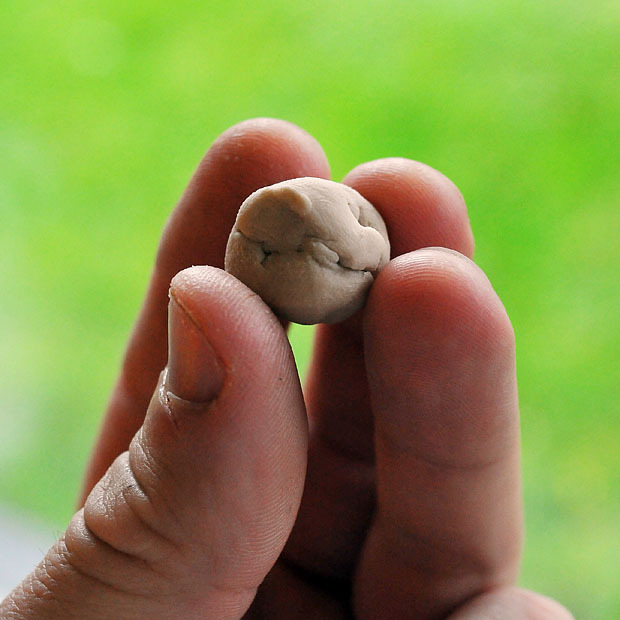 I bake a no-knead bread in covered silicon forms and want to understand “whys” before buying new equipment. My guess: A preheated pan will allow the bottom of the bread to set immediately and thereby prevent it from sticking to the pan. It’s true that a cold pan would give more oven spring, but then you’d have to shorten down on the last proofing. If you overdo the proofing and/or oven spring the bread will become to loose with huge air bubbles. But why not give it a try and report back? I’d be happy to hear how it turns out! As I mentioned I am using silicon forms with silicon covers (just a second silicon form) and like my results. I remove cover after about 35 minutes. I do not remember getting huge air bubbles or even large air bubbles. However it may give me an excuse to buy some new equipment. Do anybody know if enameled vessel is better than just plain cast iron? By cutting back on the yeast amounts you would need to allow the bread to proof longer to get the same results as with more yeast less time. By doing so, you are actually getting more out of the yeast, the full potential if you will. Less yeast have to work harder to stretch the same amount of flour (some of it may die giving it that overly yeasty/beer flavor). Also, with more time the dough could start to ferment slightly, giving it that slight sour dough taste. As Ole Marius says above http://www.nytimes.com/2010/02/24/dining/24curious.html has a good discussion about the percentage of water used. The interviewee Michel Suas, founder of the San Francisco Baking Institute recommends 68%. http://video.nytimes.com/video/2006/11/07/dining/1194817104184/no-knead-bread.html the dough seems to me to be much dryer and more easy to handle than the dough I get when I follow Jim Lahey’s recipe. These significantly improve the flavour and texture of conventionally made bread, I haven’t tried it with No-knead but I imagine it would have an effect. Twenty-five percent of the flour and an equal weight of water is taken from the recipe, combined with the yeast and no salt. This is allowed to ferment for between 2 and eight hours then added to the rest of the ingredients in the final kneading. There is a good discussion of sour dough starters here by a chef doing it every day for his restaurant. I find I get much better flavour and texture with this starter and it only taxes six to eight hours for the first rise rather than 12 to 18. Jeg er ikke kjemiker og skjí¸nner ikke helt hva forklaringen om fuktighet osv innebí¦rer 😉 men ní¥r det angis 300 g vann..vil det tilsvare 3,4 eller 5 dl? Har tatt utgangspunkt i gram for hvetemel men det har fí¸rt til en veldig – for – ví¥t deig og ditto tilfí¸rsel av hvetemel etter hevingen, for í¥ unngí¥ at jeg mí¥ helle en slags melsuppe opp i jerngryta. Hva vil du si 300 g er i dl? 300 g vann = 3 dL. Men jeg anbefaler deg í¥ bruke vekt for alle ingrediensene. Har du en digital vekt sí¥ kan du nullstille vekten for hver ingrediens du tilsetter. I tried this recipe two times. The first time I reduced the water to 275 gr and used manitoba (high gluten) flour. The result was good. The second time I reduced the yeast to 2 gr, substituted half of the flour with durum wheat, added 5gr of soy lecithin and used 300 gr of water. The result was better than the first attempt, probably due to the durum wheat. In both cases the crust, even if golden and shining, was way too thin if compared to bakery bread. Here you can watch the photos of my attempts. I wonder how to obtain a more thick crust. Maybe spraying the boule with water? 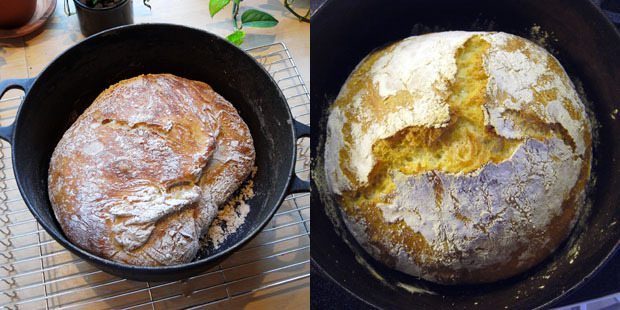 Switched to Manitoba Cream flour (by Finax – bought in Sweden – haven’t found it in Norway) – a spring-wheat with high proteinlevel – gives a beautiful and tasty bread, rises well and gives a heavenly scent in the house…. this is one of the best breads I made at home. What a surprise! I used 80% wheat, 20% spelt flour, fast acting instant yeast, 2% salt, finegrained. My bread of tomorrow has little less spelt and biological wheat. The whole-emmer bread may have come out flat, but did it taste OK? It looks like it’s decently airy. I bake my no-knead bread (Jim Lahey recipe) every week for two years and always has been successfully. But lat time it was really disaster: my loaf dropped down after I putted out of the oven and bread is very sticky without any hole, suitable for glue making only. What exactly was a difference – I replace quarter of my amount of my bread wheat flour to malted flour ( I purchased it in brewery supplies shop). Before dough kneading I heated flour in oven 10 minutes in 100 C for diastase enzyme destruction. I think that possible reason of my failure was enzymatic changes of amylan in flour (amylan was spitted to saccharides . B. Trost: Taste was Ok, but the crumb was to compact. Elena: An interesting question! I’ve never thought about diastatic vs. non-diastatic flours for baking (but having ventured into brewing I see your point). In solution 10 min @ 100 °C should be enough to inactivate the amylase of the flour. However, with dry heat I doubt that it’s enough. I would increase time and/or temperature. The use of small amounts of malt gives a great taste and the consistency, and color, but in excess quantity it soften the crumb(exactly how it happened with my last bread) and make it sticky. What exactly a chemistry of process behind it- i don’t remember. In this occasion, Martin , I want to say that I read your books with recipes and i found it very useful for me- thank you very much. what a pity that I did not see this book a year ago, I would not have” to construct the wheel “. Martin, I think that if I use your tempeature/time parameters with my flour – it will be overroasted. I think that microwave heating may be useful for enzyme destruction.